Some awful books make great movies and some brilliant books make truly ridiculous movies. Umberto Eco's The Name of the Rose belongs in the latter category. A classic thriller about murder, sacrifice and love in a medieval monastery, it should have made a great movie. Instead, in the 1986 film, protagonist William of Baskerville is played by Sean Connery, who manages to sound silly and serious at the same time. The filmmakers must have known what connections the choice would raise. Watching him in the movie felt like James Bond trying to play Sherlock Homes. Not very exciting and definitely not very intelligent. The book itself is a brilliant, slow-paced thriller, that apparently caused some fuss back in it's day. The immediate parallel is probably Dan Brown's Da Vinci Code, but comparing the two is not exactly useful. The Name of the Rose concerns itself with Christian history in a serious but compelling way and the huge amount of research done for the book shines brightly at it's heart. I had never suspected the 14th century to be this interesting. Unlike the Da Vinci Code, this book carries itself with honor, and never falls for the easiest way out. It takes it's time to build the tension, but after the halfway point, I found it extremely difficult to stop reading for more than a coffee break. The attention to detail might upset people looking for the simpler thrills of a Ken Follett novel. Not everyone will love the way how the medieval confrontation of Franciscan and Dominican monks plays a significant role in the plot. Christian dogma might seem irrelevant, when there is a sadistic murderer on the loose. 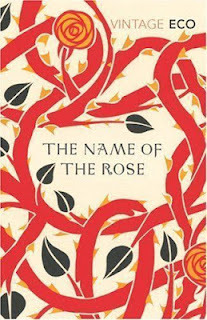 However, The Name of the Rose is first and foremost a book about books. Just as in the appendix map, the monastery library is central to all events. The murders all seem to point to something hidden deep inside the forbidden parts of the library. William and his apprentice Adso make an unlikely Holmes and Watson, but their travels in the library labyrinth make for a shuddering read. I could almost feel the wind blowing at their ankles from holes in the labyrinth walls. Again the beauty is in the details. Eco is as unassuming as he is systematic and The Name of the Rose is one of those books, where I would gladly have a reference work with which to explore the mentioned books more closely. You see, before the printing press was invented, books were precious works of art hand-copied by monks in monasteries on the finest papers. Losing a copy could be the equivalent of wiping it from the face of history. With the right amount of patience, The Name of the Rose is a great read. While it does take it's time in arriving at it's apex, it carries you there with grace and intellectual beauty. For the same reasons perhaps, it makes for such a bad film. Next up on my list will be Anthony Ross Sorkin's Too Big to Fail, a non-fiction epic about the collapse of the financial system. Based on the first few pages, it's more about the people involved then anything else, which for now is extremely promising.